In this article, philanthropist Julian Omidi discusses the study suggesting that exercise assists with physical memory retention. Julian Omidi is cofounder of No More Poverty with his brother, Dr. Michael Omidi, MD. If you are interested in increasing proficiency in a new skill, jump on a treadmill! Yes–it seems, according to a recent article in the New York Times, that in addition to providing massive benefits to physical and emotional health and well being, exercise actually improves information retention. So, what does this mean? The evidence suggests that physical exercise can help with the retention of physical memory. Physical memory is classified by the association with the memorization of patterns of physical movement, as opposed to intellectual memorization of word patterns or formulas. Previous studies have indicated that exercise does improve the ability to remember, but there hasn’t been any data specifically linked to physical memory. Now that these results indicate that exercise might strengthen physical memory, the possibilities are legion. Physicians in Copenhagen, where the experiment was conducted, are working with children to find out if engaging them in a workout after their schoolwork helps them to retain information at higher degree accuracy. It isn’t exactly known what induces the brain to retain memory after exercise; it is suggested that the substances such as noradrenaline released in the brain might have some effect on learning. However, the timing of the exercise is essential; it must occur immediately after information is first retained. This exciting discovery might lead to innovations in education and memory rehabilitation after an injury or trauma! Reynolds, Gretchen. “How Exercise Can Help You Master New Skills.” NYTimes.com. The New York Times Company, 26 Sept. 2012. Web. 11 Oct. 2012. <http://well.blogs.nytimes.com/2012/09/26/how-exercise-can-help-you-master-new-skills/&gt;. As a resident of Los Angeles, Julian Omidi wants to review the recent free healthcare clinic held at the LA Sports Arena. Julian Omidi recognizes the importance of helping those without health care, especially the impoverished, which is why he formed No More Poverty with his brother Dr. Michael Omidi, MD. 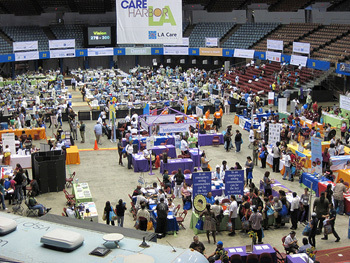 Yesterday (September 27th) saw the beginning of the fourth annual free health care clinic help at LA Sports Arena. Just shy of 5,000 people are exected to attend the clinic over the weekend, which will see county health workers, doctors, dentists, optometrists, and more providing free care for those in need of health care. Many of those that assembled at the sports arena had not seen a health care professional in years due to lack of adequate healthcare or any form of healthcare at all. The most heavily trafficked areas included dentists and optometrists, areas that are often not provided for by health insurance or have such a high premium that potential patients can’t afford these benefits. The massive free health clinic will offer more than just care services as it will also education for patients, preventive services including counseling on nutrition and quitting smoking, connecting these people with follow-up care at various local health centers, and county health workers that will assist people in enrolling in the Healthy Way LA free coverage program to assist many of these people until the national health insurance law takes effect in 2014. Most of the individuals seeking this assistance are not impoverished and in fact are employed but still cannot afford healthcare, unfortunately; but this is an event that is universal in its approach, as it can aid anyone, impoverished or not. If you are in need of health care and live in the Los Angeles area, please take advantage of this opportunity for the sake of you and your health. Davis, Katherine. “Intersections South LA | Free Health Care Clinic in South LA Attracts Thousands.” Intersections South LA | Free Health Care Clinic in South LA Attracts Thousands. USC Annenberg, 27 Sept. 2012. Web. 28 Sept. 2012. <http://www.intersectionssouthla.org/index.php/story/free_health_care_clinic_in_south_la_attracts_thousands/&gt;. Gorman, Anna. “Free Healthcare Clinic at L.A. Sports Arena Draws 4,800.” Los Angeles Times. Los Angeles Times, 27 Sept. 2012. Web. 28 Sept. 2012. <http://www.latimes.com/health/la-me-free-clinic-20120928,0,5290965.story&gt;.